What is heartworm disease? How does a dog become infected? Heartworm disease is caused by a parasite called Dirofilaria immitis, better known as heartworm. The parasites are long, hair-like worms that live in the right ventricle of the heart and the pulmonary artery, which is the large blood vessel that carries blood from the heart to the lungs. 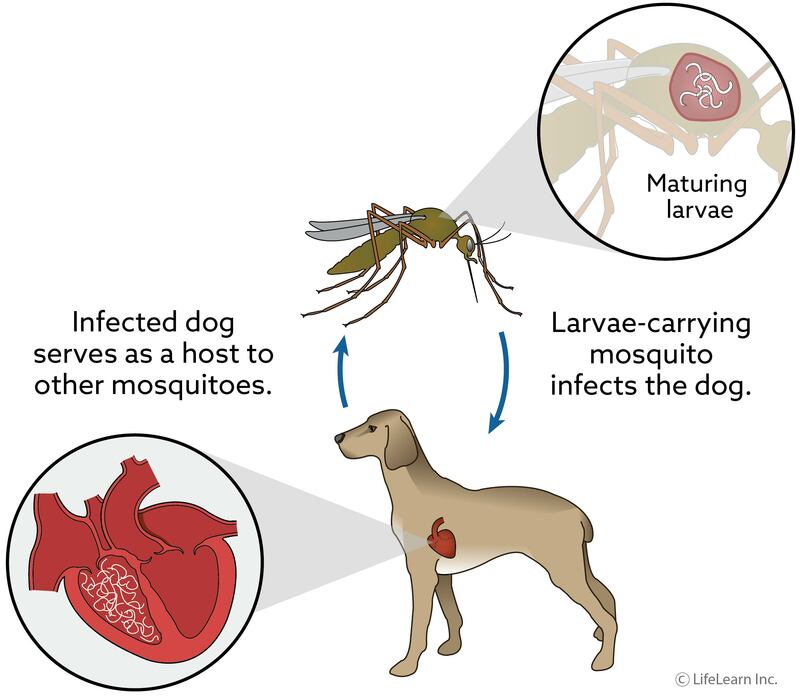 Dogs become infected when they are bitten by an infected mosquito that is carrying immature heartworms called stage 3 larvae (L3). The larvae pass from the mosquito into the dog, and move through the tissues of the body, eventually entering the bloodstream and migrating to the right ventricle of the heart. Within the heart, the worms mature into adults, mate, and produce immature worms called microfilaria, which circulate in the bloodstream. When the infected dog is bitten by another mosquito, the microfilariae are taken up by the mosquito. Inside the mosquito, the microfilariae develop through three stages of maturation to become infective L3 larvae. The larvae move into the mouth parts of the mosquito where they wait until the next time the mosquito bites a dog. It takes about 5 - 6½ months for the heartworm life cycle to be completed. Where is heartworm infection most common? Heartworm disease is widespread in the United States and is particularly common along the southeastern and gulf coasts, and through the Mississippi River valley. In Canada, heartworm infection is more restricted and is localized to southern Ontario, southern Manitoba, and southern Quebec, with scattered occurrences elsewhere in the country. The risk of infection is greatest when mosquitoes are actively feeding. This typically requires an average daily temperature of more than 64°F (18°C). In areas that get killing frosts, the risk of heartworm infection is highest in the warmer months (late spring to late fall). By comparison, in subtropical United States, heartworm infection is a year-round risk. Can infection be spread directly from one dog to another, from dog to cat, or from a dog to a person? No. Dogs can only get heartworm from an infected mosquito. There is no spread of heartworm infection from dog to dog, dog to cat, or dog to people. However, both cats and dogs can be infected by heartworm if bitten by an infected mosquito. In the early stages of disease, dogs often have no clinical signs, especially if they are carrying only a small number of worms. As the disease progresses, clinical signs become more noticeable and include reluctance to exercise, rapid fatigue with exercise, coughing, and sometimes collapse. In advanced disease, dogs develop congestive heart failure. Dogs in congestive heart failure lose weight, have a poor body condition, breathe rapidly or with difficulty, and develop a build-up of fluid in the abdomen. How is heartworm disease diagnosed in the dog? Heartworm is usually diagnosed with a simple blood test. There are two main tests for detecting heartworm infection; one test detects adult worms and the other detects microfilaria. Testing for Adult Worms: The American Heartworm Society recommends using the Heartworm Antigen Test as the primary method of testing for adult heartworm infection. This test is specific for the adult female worm. Antigen is detectable by 6½ - 7 months after infection and positive results are possible using some tests when there are as few as 1-3 adult females in the heart. Testing for Microfilaria: Any antigen test that is positive or “weak” positive should be followed up with a test for microfilaria. The presence of microfilaria confirms that mature adult worms are present in the heart and indicates the need for specific treatment to kill microfilaria. The best tests for detecting microfilaria are called concentration tests. The preferred test is the modified Knott's test, which involves using a centrifuge (a machine that spins the sample very quickly in a small circle) to concentrate the microfilaria; the other common test is the filter test, which involves passing the sample through a very fine filter that traps the microfilaria. In both tests the microfilaria are detected and identified using a microscope. What about the DNA-PCR test? This test, which detects the DNA of the heartworm, is not yet sensitive enough to screen dogs for heartworm infection. However, if microfilariae are found and there is any doubt about their identity, then the DNA-PCR is helpful to confirm that they are Dirofilaria immitis and not another kind of blood parasite. What othe methods are used to detect heartworm infection? In some infected dogs, the blood tests are negative even though there are heartworms in the heart. Other blood tests (CBC, blood chemistries, electrolytes): Abnormalities on the complete blood count (CBC) and blood tests for kidney and liver function may suggest the presence of heartworm disease. These tests will be performed on dogs diagnosed as heartworm-infected to determine the function of a dog's organs and health status prior to treatment. Radiographs (X-rays): A radiograph of a dog with heartworms will usually show heart enlargement and swelling of the large artery (pulmonary artery) leading to the lungs from the heart. These signs are considered presumptive evidence of heartworm disease. Radiographs may also reveal the condition of the heart, lungs and pulmonary vessels. This information allows us to predict an increased possibility of complications related to treatment. Echocardiography (ultrasound of the heart): An ultrasonic examination shows the heart chambers allowing the general status of the heart to be evaluated. The heartworms can also be visualized. Do all dogs need to be tested? No. Puppies less than 6-7 months of age do not need to be tested. Adult worms are not present at this age and both antigen tests and microfilariae tests will be negative. Is there treatment for heartworm disease? Treatment usually involves two types of medication: one to kill the adult heartworms and one to kill the microfilariae. Treatment is usually effective although there are cases where small numbers adult heartworms remain after treatment. There are frequent side effects associated with heartworm treatment due to dead worms being pumped out of the heart into the lungs. Side effects are more common in dogs with large numbers of adult heartworms but all infected dogs are at risk. In order to minimize side effects, alldogs undergoing treatment, even if they are not showing signs of illness, must be kept very quiet during the treatment period and for 4 weeks afterwards. Other drugs such as anti-inflammatory medication, anti-histamines, and antibiotics (Doxycyline) may be used to reduce side effects and improve response to treatment. If serious complications arise, hospitalization for further treatment may be needed. For further information on treatment, please see our handout “Heartworm Disease in Dogs”. Annual heartworm testing followed by preventive medication is recommended to keep your dog free of heartworm disease. Several excellent preventative products are available to prevent heartworm disease in dogs. Your veterinarian can advise you on which product is most suitable for your pet, and whether year round treatment is necessary. Dogs in subtropical United States are at risk for heartworm year-round, while dogs in Canada, northern United States, and Alaska are most at risk during the warmer months (late spring to late fall). Dogs from lower risk areas that travel into high risk areas should be on preventive medication during the travel period regardless of the time of year.